The Hebrew Home at Riverdale, NY, is pleased to announce its latest exhibition, Echoes of Vitebsk: Paintings by Solomon Gershov, on view in the Derfner Judaica Museum through December 2. This exhibition is open to the public free of charge Sunday-Thursday from 10:30 a.m. - 4:30 p.m. The exhibition includes five imaginative portraits by Solomon Gershov of “Tevye the Dairyman” – the Yiddish writer Sholem Aleichem’s famed protagonist who first appeared in a short story in 1894 – and a sixth painting, Sabbath Evening. Gershov was persecuted for his criticism of government-sanctioned Official Art in the Soviet Union in the 1930s and again in the 1940s. With Tevye, he may have intended to symbolize the sorrow and humanity of his experiences and the challenges faced by other Soviet Jews. His handling of the brushwork is loose and expressionistic and the color palette varies from monochrome black and white to fiery oranges contained by dense outlines. Gershov expresses the darker aspects of Aleichem’s work – the writer has been called the greatest humorist in Yiddish literary history, yet his stories often address the more tragic aspects of eastern European Jewish life. Gershov was born in Dvinsk, Latvia, in 1906, and moved to Vitebsk, in Lithuania, as a very young child. There he studied at Yehuda Pen’s art school and with Marc Chagall. When Gershov was arrested in 1932, all of his works were destroyed and he was exiled to Siberia for three years. He settled in Moscow after his release. During World War II he was evacuated to Novosibirsk and served in the Army where he worked on a military newspaper. He returned to Moscow in 1946. Solomon Gershov (Russian, 1906-1989) , Sabbath Evening, n.d., oil on canvas, 21 ½ x 26 in. The Art Collection at The Hebrew Home at Riverdale. Gershov responded to the Holocaust by focusing on Jewish themes in his work. In 1948, he became a victim of Stalinist terror – the widening attacks against Jews who openly expressed their national identity. He was arrested and deported to the far north, the coal mines of Vorkuta. Once again, his artworks were destroyed. In 1956, he was released and lived the rest of his life in Leningrad (now St. Petersburg). 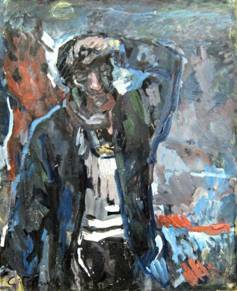 Despite the hardships he had endured, after his name was cleared and his reputation restored, he was particularly productive, creating hundreds of paintings in oil and tempera on canvas, card, paper, porcelain and plastic until his death in 1989. The works in this exhibition were acquired for the Hebrew Home Art Collection from the Grosvenor Gallery inLondon in 1975. As a member of the American Alliance of Museums, The Hebrew Home at Riverdale is committed to publicly exhibiting its art collection throughout its 32-acre campus including the Derfner JudaicaMuseum and a sculpture garden overlooking the Hudson River and Palisades. The Derfner Judaica Museum + The Art Collection provide educational and cultural programming for residents of the Hebrew Home, their families and the general public from throughout New York City, its surrounding suburbs and visitors from elsewhere. The Home is a nonprofit, non-sectarian geriatric organization serving more than 7,000 elderly persons through its resources and community service programs.